Sometimes the term Chocolate refers more to the color of a plant than the scent of the plant, as in the case of Chocolate Mint Scented Geranium. This tantalizing plant has a handsome chocolate-colored vein that runs down the rib of the leaf and fans out into its fingers. The almost black variegation fades to a rich green as summer progresses, and returns again each spring. While this is a great-looking plant with a rich minty fragrance, it does not smell or taste like chocolate. The potted Chocolate Mint Scented Geranium above is about three months old. It was started from one of our three-inch pots. The pot shown holds about 15 gallons of soil and, as you can see, it is quickly filling up that space. A pot like this makes a statement and adds interest when set next to an entrance where it can be easily pet. 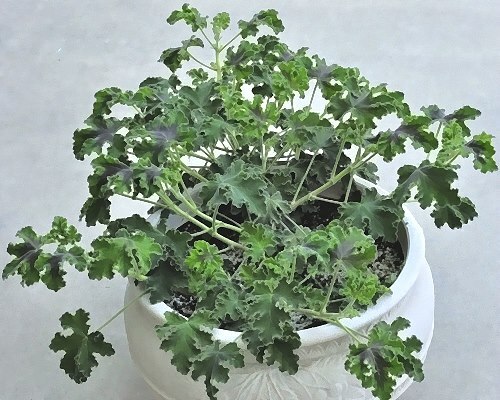 This potted Chocolate Mint Scented Geranium was transferred to the ground in its fourth spring because it was just too big for a container. While it will die back to the ground here in Zone 8, it is now about four feet in diameter and thriving. 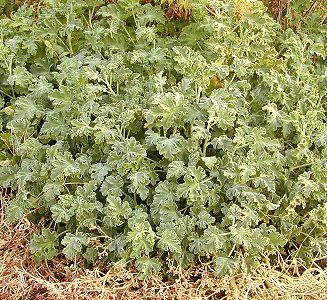 This photo shows Chocolate Mint Scented Geranium in early winter. As you can see, it is attractive, but has no blotch. This plant is about two feet tall and three feet wide. It will die back to the ground in late winter but in our normal winters (mid 20's) it will not die. 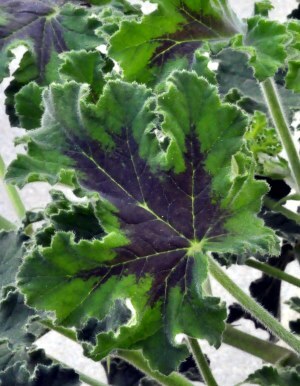 Chocolate Mint Scented Geranium makes a great addition to our Zone 8 Fragrant Herb Garden Six Pack. Take a look at our other chocolate plants.